HowMaster explains with published examples exactly how effective writing happens. Ebook $10.95 Download Ebook instantly! Countless books explain the writing process as something to be crafted with a combination of English rules and creative expression. While those tools definitely have place the scribe must in the end put pen to page or fingers to keyboard and write. Not such a simple task especially when a study book explains what should be done in order to craft a work and then fails to show how. 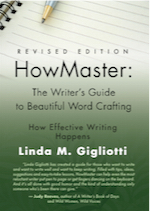 HowMaster: The Writer’s Guide to Beautiful Word Crafting does that. The personal guidebook explains with instructions and samples of published works how to craft sentences and paragraphs that come to life in the reader's mind. Included as well are how and where to find ideas, how to write from prompts and journal entries, and the effective writing of the short story, article, and novel. Exercises follow each chapter. HowMaster is a wise choice for the writer who wants to weave words around the reader’s heart. 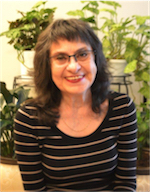 Author Linda M. Gigliotti has history as private writing instructor and report checker for the students of her local university as well as for other users of the written word. As well she worked as an instructional tutor for a correspondence writing program and as a columnist for a local news outlet. She lives in Canada where she practices what she preaches about staying fit to write.